I really like the look of twisted fringe. Unfortunately, the only directions I’ve seen for making it haven’t suited my all thumbs abilities. 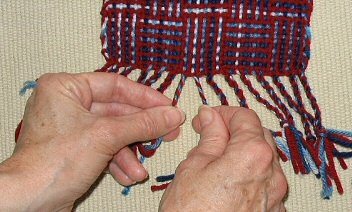 The method of “twisting two bundles until they ply back on themselves and then let go and let them twist themselves” hasn’t worked for me. Not to be defeated by my own ineptness, I decided to give twisted fringe another try with this series of log cabin scarves. To my delight and relief, I discovered that if I controlled the whole process in slow motion, I could achieve successful results! 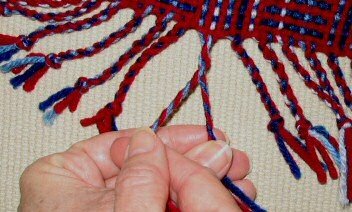 Twist each bundle to the right (clockwise or Z twist) between the thumb and index finger of each hand. Cross my right hand over my left and exchange bundles. This plies them in a counterclockwise or S fashion. Repeat, repeat, repeat. Actually this can be done fairly quickly. I’m sure this method is written down in some book somewhere, I just don’t have that particular book!